How Many BTUs on the Head of a Pin? ...er...Power Line? NOTE: This is the fifth article in our series Electrification 101 – a discussion aimed at informing transportation professionals, decisionmakers, and the public at large of the value and advantages of electrifying transportation operations, and the electrification of public transport systems in particular. For many decades, it's been widely accepted within the fields of transportation, energy, and urban planning that electrified public transportation – and pre-eminently, electric rail mass transit – provides an exceptionally clean, energy-efficient form of mobility. Thus, in an era when the global supply of petroleum appears to be peaking ("Peak Oil") and the concern is growing over the threat posed by Global Warming and the effects of carbon (CO2) emissions, attention is increasingly turning to electrified public transport as an effective tool for helping address these critical problems. Transitioning from internal-combustion modes, such as motor buses, to electric public transport as part of the solution would seem to be a no-brainer. 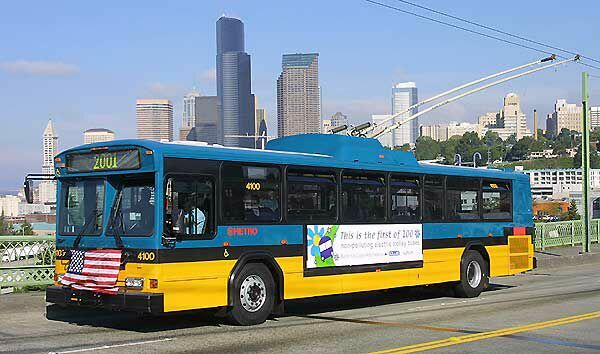 But partisans of petroleum-fueled motor vehicles (especially, private automobiles and motor buses) have lately launched a campaign to disparage the energy-efficiency of electric transit – focusing particularly on claiming that electric rail modes supposedly consume, on average, more energy per passenger-mile. In the USA, the dispute over energy centers around the BTU, or British Thermal Unit, a commonly used measure of heat-energy that enables a comparison between diverse forms of energy production and consumption, such as coal, natural gas, petroleum, nuclear, etc. (The equivalent metric unit of energy measure is the joule.) in what might be called the "Battle of the BTUs", opponents of electrified public transportation have seized on a new figure for assessing the energy content of electric power recently publicized by the US Department of Energy's Oak Ridge National Laboratory (DOE/ORNL). Traditionally, an energy conversion value generally ranging between 3,412 to 3,415 BTUs per kilowatt-hour (kw-hr) has been commonly accepted worldwide for converting electric power into equivalent BTUs, and thus facilitating equitable comparisons of electrical energy consumption by electrically powered transportation modes with transport modes powered by motor fuel (including natural gas). This conversion factor has proven useful and widely accepted because it assesses energy content at the point of use and thus enables a fair comparison of electric-powered modes with the energy content of, say, a gallon of diesel fuel, a cubic foot of natural gas, or other power sources for transportation also measured at the point of use. This figure does not take into account the fact that electricity generation and distribution efficiency is approximately 33%. "If generation and distribution efficiency are taken into account, 1 kWhr = 10,339 Btu. Now, in an ordinary, placid, purely scientific context, whether electric power should be counted as 3,412 BTU or 10,339 BTU might be of little interest beyond the scientific community and perhaps those who deal with measuring gross energy consumption and effects such as carbon emissions. But in the context of the ongoing Transit War in North America, it's no ordinary issue, since motor vehicle proponents, on a crusade to discredit electric rail public transport, have embraced the three-times-higher BTU figure and are proceeding to brandish it as a weapon in basically invalid comparisons with automobiles and buses (for which they calculate energy usage based on the end-user energy content). Certainly to no-one's surprise, rail transit critics are presenting calculations highly favorable to petroleum-fueled modes, particularly private motor vehicles and motor buses. To many outside or on the periphery of these issues, this might tend to sound like an argument similar to the classic (Middle Ages) theological dispute over "How many angels can gather on the head of a pin?" in this case – how many BTUs on the end of a power line? 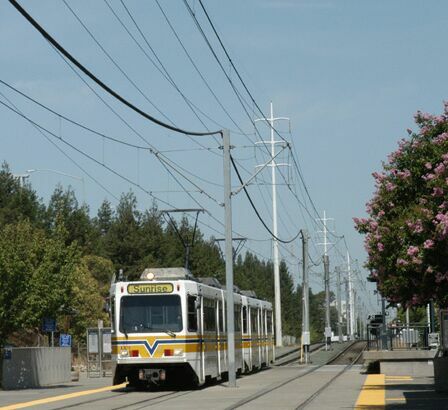 A Sacramento electric light rail transit train arrives at 39th St. station beneath electric power transmission lines which share right-of-way. Proponents of motor vehicles, including private cars and motor buses, have seized on issue of power generation back at the point of power generation and distribution to claim electric transit is supposedly "less efficient" than motor vehicles using petroleum fuels. But this is more than just an arcane issue disputed among a handful of hairsplitters – it ultimately impacts issues of national and even international energy and transport policy. Indeed, it's possible that elements representing or promoting the petroleum industry (who have already launched a national media blitz across the USA extolling "clean" diesel fuel and its contribution to "blue skies") are trying to distort this issue in a way to make it appear that electrical power for transport is extremely inefficient and motor fuel transport is relatively very efficient – all with a goal to winning the "PR" war in the context of growing public concern over Peak Oil and Global Warming. The problem with the Data Book methodology (as hinted above) is that the authors imply that it is valid to compare electrical energy produced at a distant power plant with diesel, gasoline, or natural gas fuel in the tank of a motor vehicle – a clear apples-to-oranges comparison, and not accepted as the basis of comparison except for a relatively tiny circle of electric rail transit opponents who have not problem blithely ignoring this fundamental logical error. Throughout the rest of the world, researchers tend to use the 3,412 BTU/kw-hr figure (or 3,415 or another value very close to this) because they realize they're comparing the propulsion "fuel" (electricity or petroleum or whatever) at the point where it's used..
One cannot take the diesel fuel in the fuel tank, ignore all the energy it took to get it there, and then compare that energy content with the energy way back at a power plant, hydroelectric dam, or wherever. Undoubtedly, that need for equivalency is probably why the rest of the world prefers end-user energy usage as the basis of comparison, and accepts the 3,412-3,415 conversion values. Nevertheless, if we assume it is useful to calculate the relative energy efficiency of electric vs. motor fuel transportation modes with generation and distribution energy investments included, can we derive a reasonably equitable comparison? · The most efficient combined-cycle system, the General Electric "H System" generator, is 60 percent efficient. · Natural gas recovery is 97.5 percent efficient, and processing is also 97.5 percent efficient. · The electric power grid has an average efficiency of 92 percent. Citing different professional reference sources, San Francisco engineer Norman Rolfe likewise argues that the generation efficiency of modern fossil fuel power plants is significantly higher than the US DOE assumes – in Rolfe's analysis, ranging from 40 to 45%. Rolfe cites as his source Marks' Standard Handbook for Mechanical Engineers, 9th Edition, 1987, Table 9.4.4, page 9-56. "That's why I use the figure of 45%" states Rolfe. "Efficiencies have probably increased since 1987." Combined cycle plants generally have generation efficiencies of over 50%. A combined cycle plant built in the 1990s in Oregon has a generation efficiency of 53%. Source: Presentation before the institute of Electrical and Electronic Engineers, Power Engineering Society, San Francisco Chapter on March 18, 1997 by Ray Hanley of U.S. Generating Co. I have read of more recently built plants having thermal efficiencies of 55%, maybe as high as 57%. The generation efficiency of nuclear power plants ranges from 33 to 35%. Source: Marks' Standard Handbook for Mechanical Engineers, 9th Edition, 1987, Table 9.4.5, Page 9-57. And then we have hydro plants, which have generation efficiencies of nearly 90%. Source: information supplied by Larry Klein, General Manager, Hetch Hetchy Water and Power on March 25, 1997. The combined turbine and generator efficiency for Hetch Hetchy plants is 89.8%. All of the electricity used by SF Muni [San Francisco's transit agency] comes from the Hetch Hetchy hydro plants. I think BART [Bay Area Rapid Transit] gets its electricity from Northwest hydro plants. Admittedly there is not as much hydro generation in the East as in the West, and it is doubtful if there will be large hydro plants built in the future, but there is some future for small hydro. But the East is not completely without hydro power. There [are] Conowingo Dam and others .... And the Saint Lawrence Project. Figure transmission and distribution losses at 5-10% – of that 45% or whatever the plant efficiency is. Based on these considerations, our analysis concludes that it is reasonable to assume a slightly higher efficiency (35%) than that estimated by the Data Book researchers – reflecting the USA's gradual introduction of more efficient power generation processes in recent years. Now, how can an equivalent "production/distribution" efficiency be assessed for motor fuel provided to end-users? One way of approaching this is to proceed from the standpoint of the energy market and the pricing mechanism. Light Rail Now Project researchers wondered: Does it not stand to reason that the relative price of net energy for either electric power of motor fuel would reflect all the inefficiencies involved in production and distribution? Therefore, could this not be a way to compare the relative production/distribution losses for either source of consumer energy? Thus, Light Rail Now Project researchers undertook to assess the relative costs per BTU for each mode's energy use per the analysis described below. The most recent national average cost per gallon of gasoline motor fuel is $2.84. The most recent national average cost per gallon of diesel motor fuel is $2.90. Thus, per BTU provided at the ultimate point of consumption, electric power seems to be 30% more costly than gasoline, and about 33% more costly than diesel fuel. On the assumption that (a) labor costs and productivity between the two forms of end-user energy product are roughly the same, and (b) the cost or "investment" inputs that determine ultimate cost to the user mainly reflect the raw energy consumption and other, similar, activities and investments needed to create the energy in BTUs available to the ultimate user, pricing could be taken as a means of assessing relative energy production and distribution efficiency. On the basis of the end-user cost differential, and if pricing is to be taken as a yardstick of efficiency, the calculation so far suggests that the relative efficiency of the energy, delivered (distributed) from the production point (i.e., power generating plants for electricity, refineries for motor fuels) only differs by about 30-33%. In other words, the 30% to 33% higher cost per BTU of electric power could be interpreted to represent the extra "wastage" of energy, or lowered efficiency, that occurs in the process of power generation and distribution. However, at least some of the relatively higher price per BTU of electrical energy delivered to the end-user may alternatively reflect, to some extent, a "premium" based on the greater value of electric power because of its greater flexibility as a power source. In other words, while motor fuels can power highway motor vehicles and railroad locomotives, plus a few other machines such as lawn mowers, portable generators, etc., electricity is far more versatile (capable of powering everything from lighting to kitchen appliances to air conditioners to elevators to industrial machine tools to computers to water purification systems to pipeline pumps, and so on and on) – and thus electric power can command a higher, or premium, market price. The higher cost per BTU might reflect this premium. Therefore, the "differential" between the end-user price of motor fuel vs. electric power as a measure of relative efficiency may actually be much smaller than the nominal price differential would suggest. This in turn suggests that the relative production/distribution efficiency of motor fuel is fairly close to that of electric power. The pricing analysis summarized above may be useful in suggesting some approximate guidelines of relative production/distribution efficiency, from the standpoint of the end-user, between electric power and motor fuels. However, in an attempt to identify more precisely the comparative production/distribution efficiency of motor fuels, a more detailed assessment of factors is useful. Thus, the following analysis provides a somewhat rough and rather conservative effort at calculating these energy losses (i.e., "wastage") in the production/distribution of motor fuel. For appropriate comparison with electric power resources, the analysis focuses on the additional energy involved in the production of motor fuels from the refinery (i.e., beyond the level of bunker oil, commonly used in power generation) through the distribution system, including fueling stations, to the tank of the motor vehicle.
. . . production of the gas[oline] and its transportation to the gas station is on average 81.7% efficient, meaning that 18.3% of the energy content of the crude oil is lost to production and transportation. Martin Eberhard and Marc Tarpenning, Tesla Motors Inc., The 21st Century Electric Car, 6 October 2006. Allowing for some losses in operation of fueling stations (including service stations), we could round this down to 80% efficiency – i.e., energy losses tallied at 20% using this "inventory" method. Well-to-Tank Energy Use and Greenhouse Gas Emissions of Transportation Fuels – North American Analysis, June 2001, by General Motors Corporation, Argonne National Laboratory, BP, ExxonMobil, and Shell. Vol. 3, Page 59. Current process energy values from the Energy and Environmental Profile of the U.S. Petroleum Refining industry were used to estimate CAE. Electricity losses incurred during the generation and transmission of electricity are excluded [DOE 1998]. The GREET (Greenhouse Gases, Regulated Emissions, and Energy Use in Transportation) model, developed mainly by Argonne National Laboratory and the US Department of Energy, is useful, but appears to attempt to assess the complete life-cycle energy investment in various types of motor vehicles, including the process of manufacturing and eventual disposal – whereas our own analysis focuses more simply on the energy investment in the production of motor fuels from refinery to vehicle tank. It is also not clear whether the GREET model (or other similar models assessing the production/distribution energy involved in motor fuels) has used an energy-efficiency basis of 80% or otherwise in converting the energy expenditure for motor trucking of motor fuel to BTUs. From this and the other information cited, it is plausible to assume that the GM et al. motor fuel production/distribution energy assessment cited above (which is related to the GREET model) significantly underestimates the total energy expenditure involved in the production and distribution of motor fuel. On this basis – and the energy differential indicated by the pricing analysis previously described – it is plausible to subtract an additional conservative adjustment of 5 to 20 percent from the 80% efficiency figure referenced above, to account for such additional energy losses in the refinery production and ultimate distribution process. To remain conservative, this analysis calculates a final efficiency figure of 75% in the production/distribution of motor fuel. Actual motor fuel production/distribution efficiency may well be less than this, since the differential in implied efficiency is still greater than that implied by the pricing analysis approach (i.e., comparative cost to end-user per BTU provided, which suggests near-parity in efficiency between electric power and motor fuel provided to the end-user). US Department of Energy's GREET model may not fully account for all the energy losses in use of electrical energy in refining and both electrical power and motor fuel consumption in distribution of motor fuels. In regard to the energy of motor fuel vs. electric power propulsion, one must keep in mind that, in addition to production and distribution efficiency, there also comes into play the direct efficiency of the given transport mode, involving internal combustion engines and rubber tires vs. electric motors and steel wheels – and, in this respect, electric rail modes tend to excel. Rail transit's steel wheels tend to eliminate the energy wastage inherent in the "flattening" of rubber tires as they bear weight, and highly efficient electric traction motors avoid the relative wastage inherent in internal combustion engines. These technological factors, plus the higher load factors characteristic of rail transit, tend to produce significantly higher overall performance efficiency for rail. So, when all these efficiency calculations and associated factors are pulled together, how do various major urban transportation modes stack up in comparative energy efficiency? To assess efficiency, we'll calculate energy intensity with a measure of BTU per passenger-mile. The ORNL's Transportation Energy Data Book, Edition 26, presents a figure of 3,496 BTU/passenger-mile However, this figure has two problems. First, it is based on a mix of both urban and intercity travel and vehicle occupancies, yielding a multi-use average of 1.57. But why compare urban transit travel with intercity automobile (including SUVs, etc.) travel? The occupancy rate for urban automobile travel is approximately 1.2 – thus, about 24% lower than the average figure given in the Data Book. Correcting for this, we get an urban energy-intensity of about 4,320 for urban automobile (personal motor vehicles, including sedans, SUVs, etc.). However, we now encounter the second problem – that is, the ORNL's average energy intensity figure is based only on end-user energy (i.e., the energy content simply of the motor fuel in each vehicle's tank). Correcting again for production/distribution energy, we can use the 75% efficiency figure derived above. This yields a figure of about 5,760 BTU/p-m (passenger-mile) – substantially higher than the average typically presented for urban/intercity travel and based merely on fuel-tank energy. For comparison, this analysis assesses several major urban transit modes: motor bus (diesel and natural gas), light rail (LRT, electric), rail rapid transit (RRT, electric), regional passenger rail (RPR, "commuter rail", electric and diesel), and trolley bus (electric – see photo at right). Average performance data for 2005 were taken from the American Public Transportation Association, Public Transportation Fact Book, 58th Edition, May 2007. The table and graph below provide a comparison on the basis of fully assessed energy consumption, including production, distribution, and end-use, for each mode. Clearly, these major public transit modes provide substantially improved energy efficiency than private motor vehicles – as gauged by energy intensity (lower = better) – with definite potential for significantly reducing US dependency on petroleum. But what about carbon emissions? Whereas 100% of the energy used by all petroleum and gas-powered transportation modes emits CO2, only about 70% of US electric power is derived from CO2-emitting sources. The table and graph below – again, on the basis of fully assessed energy, including production, distribution, and end-use, for each mode – compare energy intensity with respect to carbon-emitting energy sources. Obviously, electric rail transit and electric trolleybus modes provide substantially better carbon-based energy efficiency than motor vehicles, either motor bus or private car, and thus represent a very promising tool in the effort to reduce carbon emissions and thus to mitigate Global Warming. Hopefully, the foregoing analysis will inject some much-needed factual information into the energy debate and America's ongoing, relentless "Transit War", and help to move this discussion somewhat closer to the realm of reality.